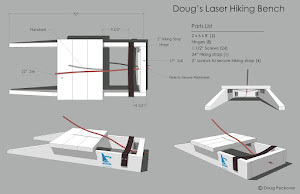 The ISA has started a series of articles that will help you hike a little less going upwind. I'm really impressed with their coaching, so if you haven't checked them out this would be a good time. Their clinics, conditions, and facilities are first class. Thanks for an excellent tip - the website looks great. As for the steering, have you tried their technique? Your thoughts? Yes and it works, especially if you add a little backward movement going up the wave and forward movement going down the wave. Moving back and forth is a way to drive the boat a little harder without having to hike harder. But... some people have the exact opposite weight movement as I mentioned in race 3 at the 1998 World Master Games (see the link in the right column). So pick your style based on what works best for your hiking style. Very interesting. Well, tip one is interesting. The other three I guess are common knowledge. Almost stalling the rudder to keep the longest possible waterline?? Will need to experiment with that. Thx for sharing. Thanks for the comments all. The long waterline is one advantage. Another benefit, probably the primary one, is the reduction of bow impact drag. By momentarily bearing away down the face and staying more in contact with the wave, you reduce the slamming at the bottom, and therefore slowing of the boat. It's a great tip. Sailing beside someone and listening to how the two boats go through the waves will tell you who's best at managing bow impact. 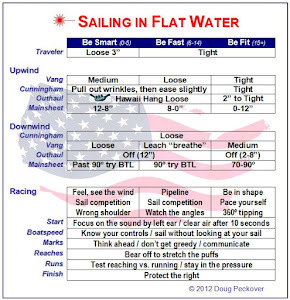 (1) I have been aware that some sailers push the tiller when hitting a wave and pull the tiller after that. But I have not been clear about why they do this and how that can move the boat faster. This tiller handling seems consistent with this article. So, is the main point to "pulling the tiller" part after hitting the wave (rather than "pushing" part), and the reason to do so is to keep the bow in contact with the wave? (2) Why pulling tiller can keep the bow in contact with the wave? Is that because the angle against the wave becomes wider (or narrower depending on from which we look at it) and the slope to go down becomes less steep? (3) Is the Nick Thompson's aggressive tiller handling in the following video clip basically the same movement? (4) In choppy waves whose distance between the waves are very short, I often almost stop the boat by the bow slapped hard against the wave. Is the tiller handling technique still basically the same in this case or there is another tip to handle very choppy waves (like the ones in San Francisco). 1) Correct. To be clear, when we talk about "hitting a wave", let's assume that means "the impact at the bottom of the wave". Just prior to impact, you've been pushing the tiller - and you should be finished with that at impact or just slightly after if you are going through a lot of angle change. At that point, you're not far away from being near the top of the next wave, and you'll want to pull to flick the bow down again before you "launch". 4) There are multiple methods and schools of thoughts on dealing with sharper chop and most of it depends on the exact size/type and wind strength. 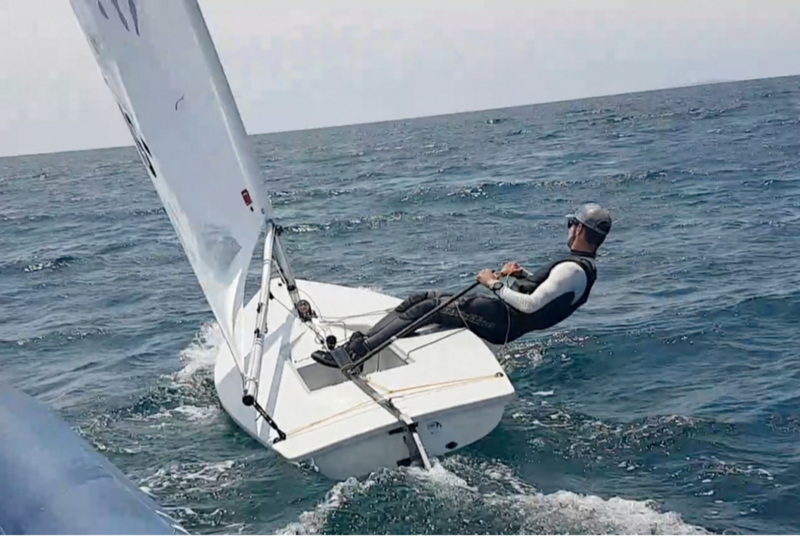 If the chop is very close together and there is solid power available, it's often fast to add a lot of weight at the moment of impact to "break through" with higher rig and board loads... and do a lot less steering. If the wind is lighter and there is chop/lump, it gets even more critical to steer actively because the impact has a greater affect on your overall speed and capacity to recover speed takes longer. We are happy to take a look at your technique and get your steering dialed in this winter in Mexico if you can make it. For now, keep experimenting and get the feel for it - try to establish a rhythm. Thank you very much Colin for the explanation! Your comment - when we talk about "hitting a wave", let's assume that means "the impact at the bottom of the wave" - was eye-opening for me. I tended to think that hitting the wave happens at the top. Come to think of it, it is obviously not. I noticed that in some of my original thinking was half phase or quarter phase off in terms of relationship with the wave position. One more question: when bearing away by pulling the tiller, I guess we do not need to sheet out because the apparent wind move forward, as the boat would speed up by bearing down the wave? Happy to help. We had a lot of fun at the Worlds too and were really happy to see everyone enjoying the conditions and event! 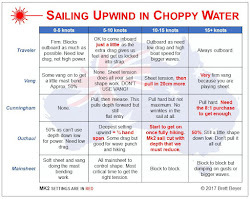 Good question - sometimes it's productive to sheet out on pull - that quick decision is based on factors including wave size, skew, wind strength, gust/lull presence, rig setup/helm, and, if we are getting down far enough to reduce impact and obtain a good place in the groove. Oftentimes we do not sheet out there as you suggest - particularly if we have a rig setup that is reasonably forgiving/wide and we are able to reduce impact enough with steering alone. Note that the pull is seen by the rig as "counterproductive" and it provides a bit of a pause before the loading occurs. We exploit this to get down to where we need to be and reduce impact... occasionally we need a little more, or a gust is on, so then we can sheet out a little. Note that sometimes even with good technique there's still a fair amount of impact at the bottom, causing AW to move aft. Because of this, we need to accommodate our AOA to reduce side loads, and prevent stall - once you establish a bit of a steering rhythm, try to drop a bit of sheet at that moment and see if you notice a difference. Thank you very much, Coliin. I will practice this tiller and body movement this weekend. I saw ISA now started accepting the registration for the new season. I will perhaps plan to join early next year!